da Costa has always been artistic, but her discovery of copper weathervane art was serendipitous. As a young adult, she was cutting and styling hair in Rhode Island. Eager to learn something new and needing to supplement her income, da Costa answered an ad for an assistant to a copper artisan. She showed up for the interview dressed to cut hair – “all Cosmo fou-fou,” she said. da Costa was instantly entranced by a majestic hawk weathervane. “It’s art I didn’t realize existed,” she said. “I immediately decided I had to learn how to do this.” She was hired to work at the front desk and to clean solder and acid-flux residue – “the worst part,” she said. But within a few months, she was apprenticing and had created her own copper gargoyle. “Lucky me – I found my medium,” she said. da Costa sketches the initial design on paper and transfers it to a sheet of copper using carbon paper. After cutting out the basic shape with shears, she uses hard and soft hammers and chasing tools to shape the flat copper into a three-dimensional form. “It’s as basic as you can get,” she said. “There’s nothing modern.” Weathervanes need clear outlines to be identifiable from a distance. “They’re very simple, but detailed at the same time,” said da Costa. She recently made a 4-foot horse that perches atop a huge barn. da Costa doesn’t follow a particular formula, and said achieving balance is intuitive. Most subjects include a weightier element that will catch the wind. “I take them outside, put them on a post, and blow on them to see if they work,” she said. da Costa’s work ranges from the fanciful to the historically authentic. She’s made crows, eagles, and pygmy owls; bears, squirrels, and horses; and mythical creatures from fairies to mermaids. Much of her inspiration comes from nature and from the swirling tendrils characteristic of Art Nouveau. To create texture, pattern, and fine detail, she uses chasing tools, which she taps with a small hammer. As she works, da Costa turns each piece over repeatedly to make sure the seams meet before she solders the halves together. A bird’s body could take four pieces of copper, plus two pieces per wing, and another two for the head. da Costa sometimes adds 23-karat gold leaf to a weathervane as an accent. “It’s another art in itself – doing it is like Zen,” she said. 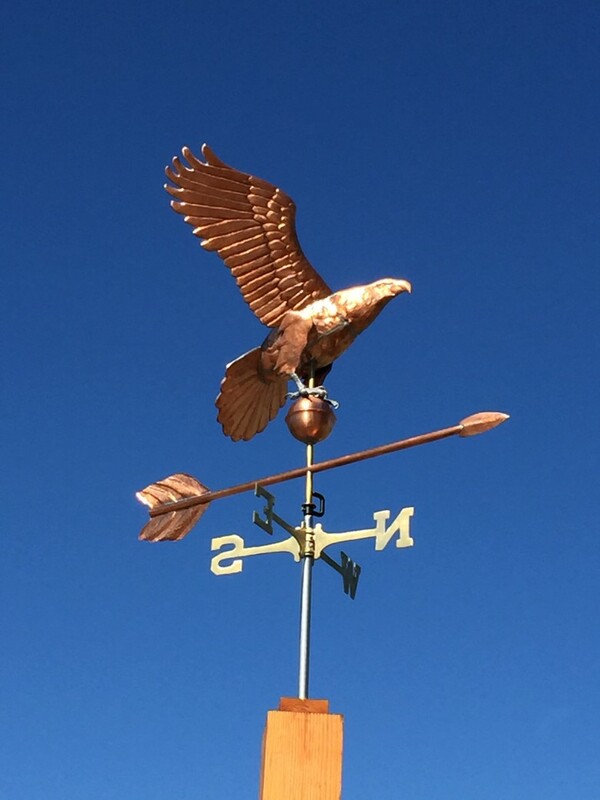 The gold leaf retains its shimmery quality even after a weathervane has developed verdigris, the deep green patina that results from exposure to the elements. 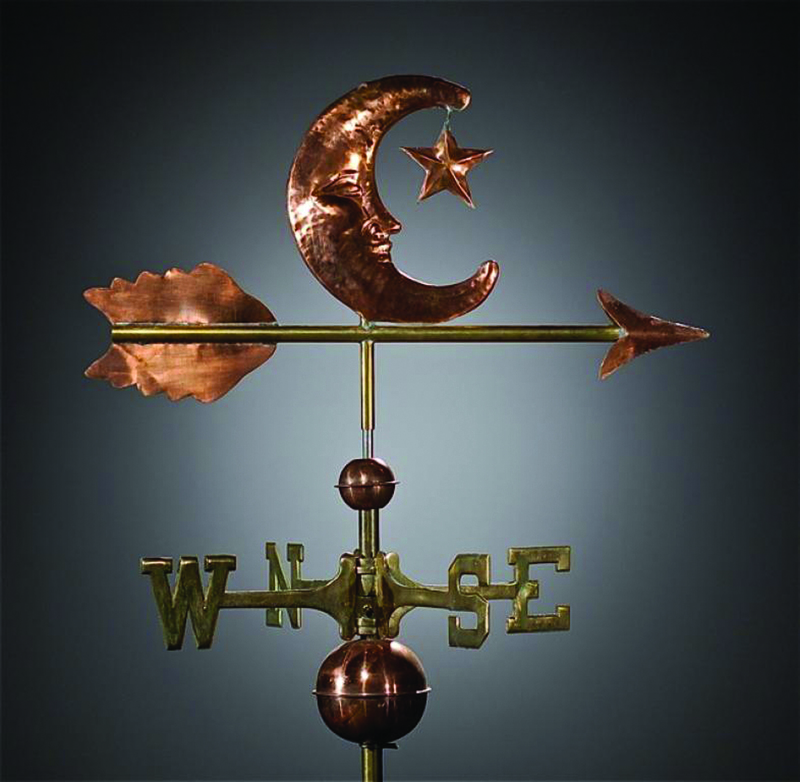 Weathervanes are common in New England, where da Costa learned to create them, but they’re relative novelties in the Northwest. Still, as da Costa’s weathervanes and sculptures become better known, people are devising creative ways to use them. She’s been invited to create garden vanes by the Bellevue Botanical Garden Society for its Arts in the Garden exhibit. She has a commission for a labyrinth, where her copper sculpture will be the reward for completing the maze. She’s created weathervanes in the form of a swimming beaver with webbed feet and a Crocker motorcycle, which will top the garage where her client restores the classic racing bikes. Her own designs tend to be more whimsical or are drawn from mythological roots. “I really like doing my own take on imaginary realities, dreamscapes, and fantasy,” she said. Those include a dragonfly, gryphon, and a classic Portuguese rooster. da Costa has been attracting notice for her skill and creativity, with invitations to half a dozen juried regional exhibits and inclusion in a book for curators and collectors. “I’ve been working towards this for a long time. I didn’t think it would happen one after the other,” she said. Last year she was commissioned to create a memorial to the three firefighters who perished in the Twisp River Fire. da Costa made an eagle that soars above the garden at a reflection site at the Methow Valley Ranger District in Winthrop. The eagle is a genuine time capsule, with a tear-shaped piece of the engine the firefighters were riding in encased in its heart. da Costa grew up in the Methow Valley and worked as a firefighter for three years, so she has a visceral understanding of the power of nature, in all its forms. An environmentalist at heart, da Costa hopes her art – with its anchor in history – can help people reconnect with nature. For da Costa, the link is profoundly intuitive and not easy to express in words. But artists are often able to capture a special quality that defies language – almost like a time capsule that contains paradoxes of life, she said. 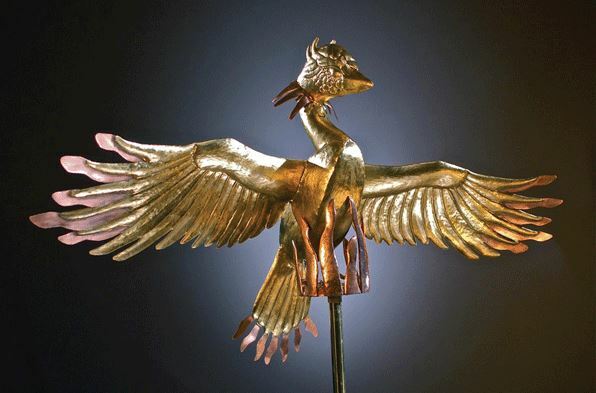 She pointed to a weathervane she based on an African mythological figure, the sankofa, a bird with its feet planted forward while its head is turned backwards. The symbol comes from Ghanaian culture, where people believe that learning from the past ensures a strong future and that, even if something has been lost or forgotten, it is possible to reclaim and revive it. Weathervanes can be a symbol of the fragility of our world. “I want to be a reminder of history. Things are changing really fast – we need to hold onto wisdom or it could be lost,” said da Costa. “I love weathervanes because of their depth and layers – they’re not thrown together as the feeling of the moment.” “I wonder if the invasion of technology is erasing our connection to nature and history,” she said. “I ultimately want to bring healing through my art, to bring people to a place of beauty, truth, and nature.” VIEW the ART Magazine center spread featuring Jessica da Costa – CLICK HERE.